The unrest sweeping across Haiti in response to the rigged October 25 presidential election is a decisive repudiation of US foreign policy, and a particularly stinging rebuke to Bill and Hillary Clinton. The Clintons must be secretly relieved that the Republican Congress wasted time investigating Benghazi, since the crisis in Haiti shows how the twosome terribly mismanaged their signature foreign initiative, leaving behind a nation sinking into corruption and violence. Anyone who has been in Haiti recently will not be surprised by the general strike, the angry highway roadblocks, and the police brutality against the demonstrators. The mainstream US press is getting to the story late, and mistakenly portraying the upheaval as an outburst of rage after a “disputed” election. This is a serious misrepresentation. What is actually happening is that the unpopular outgoing president, Michel Martelly, has spent months trying to impose his successor, using violence and vote fraud, and the Haitian people are resisting in the only way they can. Haitians bitterly accuse America of whitewashing Martelly’s various crimes, and some even charge that the stolen election amounts to a coup d’état. 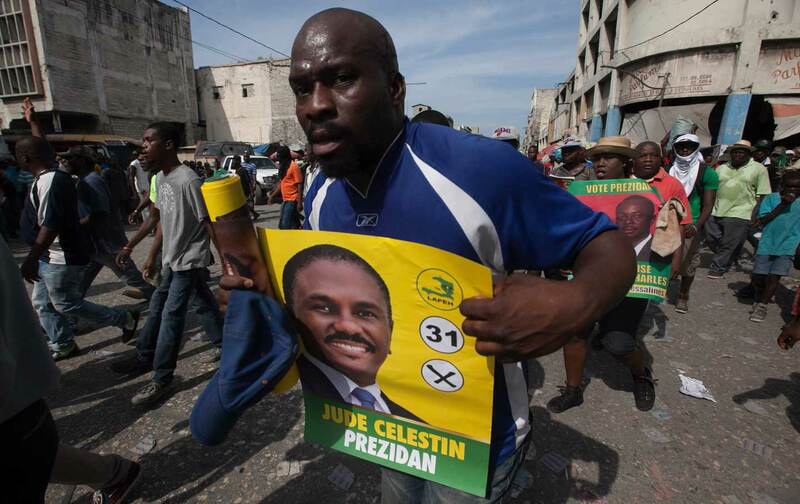 Washington spent $30 million to help pay for these elections, but the embassy in Port-au-Prince refuses to question the just-released vote results, which show Martelly’s candidate, Jovenel Moise, finishing in first place and moving on to the second and final round on December 27. 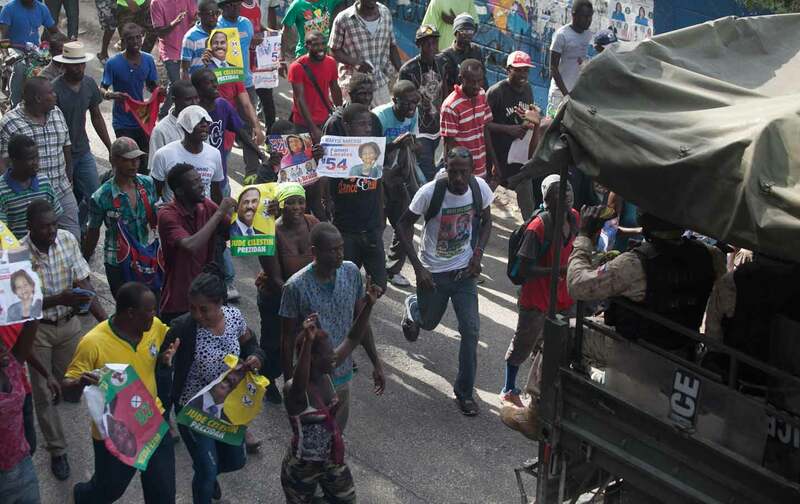 Widespread fraud was documented on election day itself by four Haitian human rights groups, including the respected National Human Rights Defense Network, and further evidence is that although the government claimed that Moise got 511,992 votes, practically no one came out on the streets to celebrate. The other seven leading candidates all refuse to accept the results and are demanding an inquiry. These days, Bill and Hillary Clinton are nowhere to be seen in Haiti, but it was not always so. The couple claimed to have a special attraction to the country after spending their honeymoon there, and even before the 2010 earthquake, Bill Clinton had already been appointed the United Nations special envoy. After the earthquake struck, his role increased, and he was a regular visitor, making speeches, cutting ribbons, and palling around with President Martelly, including attending his inauguration. Clinton became so powerful that people even started calling him “le Gouverneur.” The writer and veteran Haiti-watcher Jonathan Katz also points out that Secretary of State Hillary Clinton traveled to Haiti four times, the same number of visits she made to Russia or Afghanistan. A few months after the earthquake, both Clintons were stars at a big Donors’ Conference Towards a New Future for Haiti, held at the UN, at which $2.5 billion was pledged—intended, in Bill Clinton’s words, to “build back better.” Some $1.15 billion was supposed to come from the United States. Hillary Clinton’s warning turned out to be an accurate forecast of how the Haiti reconstruction efforts have failed dismally and been plagued by corruption and mismanagement. Here is just one example: The US Agency for International Development said it would build 15,000 new houses. Excellent detective work by, among others, Jake Johnston of the Center for Economic and Policy Research shows how USAID completely bungled the job. After nearly six years, only 900 houses have actually been built, and many of them were so shoddily constructed that USAID had to spend more to fix them. Some people did make a lot of money off the recovery, including the US and other foreign businessmen and contractors who showed up in Port-au-Prince’s few high-end hotels after the disaster. Hillary Clinton’s brother, Tony Rodham, also got involved in a Haiti-related venture: In 2013 he joined the advisory board of VCS Mining, a Delaware-based company that has attempted to dig gold in Haiti. The venture is on hold (partly because of concerns about potential environmental damage), and no wrongdoing has been shown, but Rodham was probably not picked for the board based on his technical experience. At some point, though, the Clintons should have recognized that Haiti’s reconstruction was failing and that President Martelly was growing steadily more corrupt and repressive. Bill Clinton could have used his explaining ability to point out publicly what went wrong, and Hillary Clinton could have taken advantage of her prominence as a presidential candidate to tell some important truths. Instead, the Clintons just skulked away from Haiti, and their silence today makes them complicit in the violent, undemocratic, and fraudulent regime they left behind.